Have you ever had one of those days where you head off to work or school and a sudden rain storm comes from nowhere? Or how about when you're planning that nice ski trip only to see that no snow is coming? The weather can be a fickle thing, especially when storm fronts move in from everywhere – heatwaves can be quenched in the West by storms coming from the Gulf, while the South's humidity can drift upwards to the upper East coast. Thanks to smartphone technology, you never have to be in the dark again — there are plenty of handy Android weather apps to choose from. Here, we'll take a look at the official app from the Weather Channel, available for Android phones. We'll look at some of the features, as well as how to set the weather Android app to your home screen. installing, it will naturally ask you what your zip code is, allowing you the ability to view the weather by current settings, by the hour, and even a ten day scale, just like you would if looking at the official website. The newest version now also includes mapping technology in which you can view the weather in surrounding cities. Plan on heading up to Boulder later in the day? Clicking on the pinpoint for Boulder will show you the current and hourly weather patterns for it. There's a dedicated severe weather tab that can alert you when the weather is going to get fierce enough to drive you back inside. The user interface is pretty straightforward for both the app itself and its widget. There are three size offerings here — small, regular, and wide screen. The small widget is a small square that gives you the day's current temperature, while the regular (medium) widget allows for a 2 x 2 grid that also provides a quick glance at the weather. The wide screen takes up a 4 x 2 area on your home screen, but allows for the showing of current weather, what the day will bring, and the forecast for the next day. Touching this will bring you to the main app screen, where you can view further details. To set one of these widgets on your home screen, touch any empty space and hold until a pop up menu appears. Choose widgets from the options and then scroll down until you find the Weather Channel app selections. As a big fan of the Weather Channel in general, this was one of the first apps that I downloaded when I first got my Android. I got the phone slightly before I moved from Arizona to Colorado, so it was important to me that I be able to trace the weather patterns, especially when the weather seemed to turn the week of my departure. Unfortunately, I didn't find the app to be that great in switching over from one city to another; however, I also did not have this current app that features a mapping ability. Travelers of course need to be informed of up to date weather as they make their way to different cities or states and I think the new mapping feature will be beneficial as they make their way across the states. A good point is the severe warning alerts; this was especially beneficial to me as I was traveling during heavy snow storms that hit both Arizona, New Mexico, and Colorado at the same time that I was leaving, as well as the exact places that I needed to go in order to move (as though Arizona didn't want me to leave or something). The weather reports were good to have and made planning our trip to get around the snow much easier. Overall, the Weather Channel is a fairly good standard weather app for any Android user. Definitely the new inclusion of a mapping feature to show the weather of surrounding areas will come in handy for those who travel frequently or need to know about the weather in an upcoming city. The different offering of widget sizes is great for those who want small widgets, as well as those who enjoy getting as much weather data as possible. While great for weather, it does lack some features that users might want. I for one like having my weather app combined with a clock and sadly, this app lacks that. 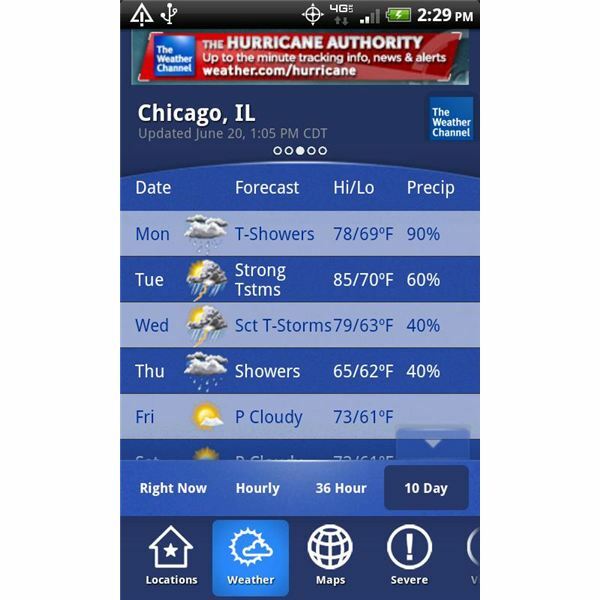 The Weather App from the Weather Channel is free within the Android Market and can be found at the link below.